including a refresh to the Ad review center and the ability to add multiple users to your account. We also introduced more reporting features, a new look to Performance reports, and enabled you to manage your account and block ads directly from your site with the new Publisher Toolbar. You asked for more tips to help increase your revenue, so we showed ways to improve your site by using social tools, going mobile, making user experience changes, and using DoubleClick for Publishers Small Business. Many of you reported revenue uplift (up to 400% for some!) after implementing specific changes recommended through an email or the AdSense interface. We had the opportunity to connect with many of you through our AdSense in Your City events (now called Learn with Google for Publishers), and through our newly created AdSense +page. We’d love to continue these interactions, so be sure to opt in to receive special offers, and follow our AdSense +page for the latest updates and Hangouts. You let us know that you value hearing from other publishers, so we highlighted publisher stories throughout the year, including Philip Martin, who became an artist with the help of AdSense. We made the payments process easier by updating the look of the Payments page in the AdSense interface and by extending payment options in Southeast Asia. We introduced changes to ad formats to provide you more options and increase your earning potential. You also told us that improved communication around the AdSense policies are important to you. We reviewed policy resources, provided some tips and announced ways we can work better together. And finally, following our annual tradition, we’re happy to reveal our most visited blog post of the year: the announcement of AdSense availability in Indonesian. Please keep +1’ing our posts to let us know when you like them and also +1 our blog in the upper right-hand corner if you’re a fan. It was a busy and fulfilling year working with you, our dedicated publishers. Stay tuned for updates on future improvements. Happy New Year, and we’ll see you in 2013! Time sure flies! We’re coming up on another year end and, with that, we’d like to take a step back to review our AdSense highlights of 2012. With your feedback in mind, we made updates to the AdSense interface including a refresh to the Ad review center and the ability to add multiple users to your account. We also introduced more reporting features, a new look to Performance reports, and enabled you to manage your account and block ads directly from your site with the new Publisher Toolbar. , shared their experience with us. Qué Tiempo is a Spanish site that displays the weather forecast globally. Ángel and Manuel became AdSense publishers in 2007 and over the years, thanks to investing in their content, optimizing their ads and growing their traffic, they’ve been able to build a team of more than 20 employees and invest in new ventures. Back in 2008, they could already see through Google Analytics that the traffic coming from mobile devices was growing, so they decided to develop quetiempo.es/mobile in-house. Their mobile traffic has successfully grown by 20% over the last two years. New users are arriving to the mobile-friendly version of their site from mobile devices, while the desktop version is experiencing a 10% year over year growth. This shows that mobile traffic is additional, not substitutional, and mobile usage is complementary to desktop. Thanks to the increase in their mobile traffic, together with a successful implementation of their ads, Qué Tiempo saw their daily earnings grow by 30%. 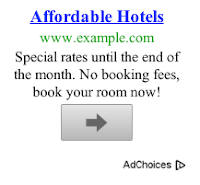 The CTR of their mobile leaderboard 320x50 now doubles the CTR on their desktop ads. In addition, the CPC of their mobile ads is 100% higher than the CPC of the desktop site. Most of Qué Tiempo’s efforts are now focused on improving their mobile site with features like geotargeting, which makes it possible to deliver accurate location-specific weather forecasts. This information is current as of December 18th, 2012. The increase in smartphone sales and mobile traffic makes it more important every day for web publishers to build a mobile strategy for their businesses. Nevertheless, only 1 out of 10 AdSense publishers has a mobile-friendly version of their site. To encourage other publishers to go mobile, Ángel Hernández and Manuel Lebrón, owners of Qué Tiempo, shared their experience with us. Two and a half years ago we started the AdSense in Your City program with the goal of meeting publishers face-to-face and providing tips to help you increase your earnings. From Orlando, Florida to Tokyo, Japan, we’ve visited over 100 cities around the world and talked to thousands of publishers. We asked you what you’ve liked and what could be improved. Based on your feedback, we’ve made some changes. We’re excited to announce that, in 2013, AdSense in Your City events will be evolving into Learn with Google for Publishers. We understand that many of you are using Google products beyond AdSense to grow your business. Our transition to this Google-wide initiative is part of our effort to help publishers like you make the most from the Web. Learn with Google for Publishers goes beyond just AdSense optimization tips. We’ll also cover new topics such as site design, analytics and ad serving. Below is our North America schedule for the next three months; our international schedule will be posted here on Inside AdSense shortly, so stay tuned! of the new 300x600 ad format, we’ve been happy to see many publishers testing it out on their pages. After carefully reviewing this ad format, we’d like to let you know about an upcoming update to our policies around use of the 300x600 unit. Because this new format is larger than all our other ad units, we want to help ensure a balance between content and ads across publisher sites. With this in mind, going forward, publishers will be permitted to place a maximum of one 300x600 ad unit on each page. If you’ve placed more than one 300x600 ad unit per page on your site, we ask that you remove any additional ad units by Jan 10, 2013. We’ll also be sending email notifications shortly to affected publishers, asking them to make this update. Please note that the limit for AdSense for content ad units still remains at three per page, so it’ll be possible to place one 300x600 ad unit and up to two other sizes on a page. As always, it’s important to consider both the user and advertiser experiences when placing any additional ad units on your pages. We appreciate your understanding and help as we make this update. Thanks again for all of your feedback and enthusiasm for this new ad format; we’re continuing to work on developing new sizes, and will keep you posted on any new developments. If you’d like more information about AdSense policies, please visit our Help Center. Since our recent introduction of the new 300x600 ad format, we’ve been happy to see many publishers testing it out on their pages. After carefully reviewing this ad format, we’d like to let you know about an upcoming update to our policies around use of the 300x600 unit. We understand text ads are important to our publishers’ business and we’ll continue to innovate on new formats. Please feel free to share your feedback and suggestions with us on our AdSense +page; we look forward to helping you find new ways to grow your online businesses. Text ads have proven to be a great way to help advertisers extend their Google search campaigns to sites in the Google Display Network, enabling publishers like you to earn revenue from your content. This is why we're continuing to work on improving text ads, even as we introduce new ad formats. One change, rolling out this week, will make the look and feel of text ads more consistent as consumers and advertisers use screens interchangeably, and distinctions between devices fade. You'll notice a new clickable arrow icon, as well as slight optimizations to font size, spacing and text layout. These enhancements are among the largest that we have made to text ads, and our experiments indicate an uplift in clicks across publishers on the Google Display Network. These changes will happen automatically for most text ads on your pages, and the color of the arrow icon will be based on the color palette you’ve selected for your ad units. For instance, if the background of your ad units is white, the icon will be grey; for other background colors, the icons will be a different shade of the background color. Consistent with our program policies, we ask that publishers refrain from mimicking these arrows or placing similar images around their ad units. 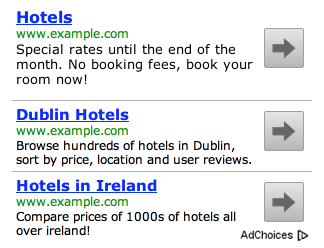 Below are some example of this new text ad format in the 200x200 and 300x250 ad unit sizes.